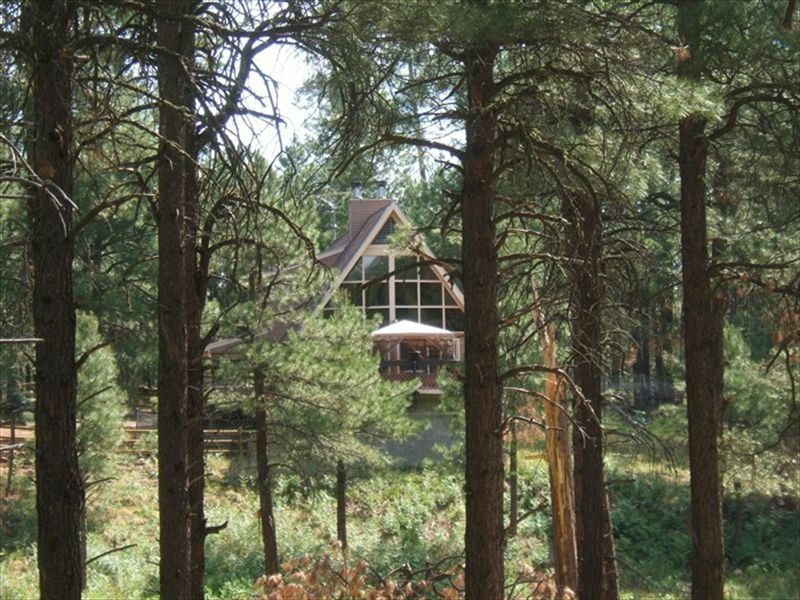 Beautiful Cabin Just 2 Hours from Phoenix! Come relax and get away from city life at this beautiful forest retreat. In a two hour drive from Phoenix, Arizona, you can be on top of the Mogollon Rim at 7700 foot elevation in Forest Lakes, Arizona (30 minutes east of Payson off of Highway 260). Temperatures in Forest Lakes are typically much cooler than in Phoenix, which makes for a lovely 'escape the heat' vacation or great for a frolic in the snow during the winter months. Nestled on an acre of land overlooking the national forest, at the end of a cul-de-sac you will have all of the privacy and room to enjoy memorable family getaway. With in a 10 minute drive, there is Woods Canyon Lake and Willow Springs which are both beautiful lakes ideal for fishing and boating. There are several other lakes within close proximity including Black Canyon Lake, Bear Canyon Lake, Chevelon Lake, Knoll Lake and Blue Ridge Reservoir. There are many other summer and winter recreational opportunities including hiking, backpacking, horseback riding, camping, biking, snowshoeing, sledding and cross-country skiing. This cabin can very comfortably accommodate two families, as there are plenty of sleeping accommodations and room. The Master bedroom is located in loft and has a king bed, private full bathroom and satellite television. Under the king bed is a convenient pull-out, pop-up toddler bed if needed. On the main floor there is a queen bed in one bedroom and two twins beds in the other. The finished basement has a fireplace, twin bed, bunk beds, futon, bar area, bathroom and laundry facilities. The cabin has a roof deck with breathtaking views of the national forest and a propane grill. There is a large stone fireplace in the family room and a fully equipped kitchen. Off of the mudroom there is a small doggy door which leads to a large fenced-in area for your dog. House is on Hill...Sled out your back door! We enjoyed our stay! The drive was easy from the valley. The kitchen was well stocked with all the cooking necessities. The fire place warmed up the cabin making it nice and cozy when coming in from playing in the snow. The host was very responsive to any questions we had prior to the trip. The only downside of our trip was the propane tank was empty so we were not able to use the grill as planned and 2 of the bedrooms had dirty sheets which was gross. Other than the few house cleaning items, we would recommend the cabin to others. Hi Alicia! Thank you so much for taking the time to write a review. I can just picture you and your family enjoying that gorgeous fireplace and warming up after playing in the snow - bet that will be memories you keep for a long, long time! We have taken your constructive feedback seriously and ordered all new sheets - the sheets were actually freshly laundered, but your feedback helped us make the decision to go ahead and provide freshly updated linens for our guests. We are also sad that the propane tank was empty - we typically have several lined up and ready to go for guests and made sure that was addressed right away. We wish you and your family a wonderful Spring and thank you for visiting our cabin! We came up to the cabin for a weekend getaway and had a blast! The kids said they wanted to live here. We were able to go sledding, drink hot chocolate and make s’mores in the beautiful fireplace. While the cabin fit our two families perfectly it wasn’t as big as the pictures make it seem. Also, there was a large amount of snow at the front door when we arrived and had to shovel it ourselves. The WiFi didn’t work even after we reset the router. Other than those small details the cabin was amazing and we would definitely stay here again! The house worked perfectly for our 2 large family's. Great sledding right outside the house on huge hill. Great time spent with family and friends. Shannon S.Where do you live? Thank you so much for your review. We are so happy to hear you had a wonderful time and thought the cabin was great! Thank you so much for the feedback regarding the heat - we typically do preheat the cabin before the arrival of any guest- we are able to do this remotely - but for some reason we had a slight technical difficulty that is actually very uncommon and has never happened before! Our goal and desire is for our guests to arrive to a wonderful retreat and be able to leave your cares at the door, relaxing in the tranquil and comfortable setting! While it certainly was cold when you arrived, we hope you enjoyed your own little area of winter's paradise - I can't think of a better place than the national forest to serve as a backdrop for this beautiful season in the high country! Thank you again for your feedback so we can make a toasty warm welcome a priority for all future guests. My family and I have been renting cabins all over Northern AZ for the past 7 years and we had problems with only this one. Half the light bulbs weren’t out throughout the house, the stove vent didn’t work, the cooking untensils were old and warped, towels were old and dingy, plates and bowls were cracked. They charge you more if there’s more than 6 people even though they advertise it sleeps 12 and I didn’t see anywhere that there would be a charge. No one was comfortable sleeping. If you sleep in the basement it gets really hot but the master stays cold. There were 7 adults and the place was too small. The kitchen was so small you could barely fit two people in there to cook. I don’t know how this place got positive reviews. Thank you so much for taking the time to review our property. It is certainly disheartening to hear that our property did not live up to your wishes. To our future guests, please take note of the many, many positive reviews that we have truly earned through the years of renting out this cabin - in fact, the guests who were at the home both prior to and immediately after this guest's stay found the home in wonderful condition and absolutely loved their time with us, and we very frequently have guests return year after year to enjoy all the cabin and location has to offer! While the home can sleep more guests, our listed rates are for 6 guests. Because hosting larger parties places so much more wear and tear on the home, we do follow industry standards and suggestions and we do have a very tiny charge for extra guests, which was very clear in the quote that you received. Our property owners maintain the highest ethical standards and would never, ever engage in a bait and switch type situation with pricing - the VRBO platform makes our pricing transparent and clear. We are terribly sorry if you misunderstood anything in the way the quote was written or how pricing worked through the VRBO platform. We do have some upcoming improvements planned in order to ensure we are keeping the property up to date and as comfortable as possible for all of our guests. We are saddened that you did not have the same experience that all of our previous guests have enjoyed at the cabin, and we wish you well and thank you for taking the time to review. More than enough room inside and out! Isolation was great and opportunities to explore were just outside the door! Absolutely beautiful cabin and area around it. Thank you for the lovely review. You picked a wonderful time of year to come and explore all the cabin and area have to offer - the National Forest surrounding the cabin makes for the perfect scene for a family like yours to relax and reconnect. Thank you again for leaving a kind review and we look forward to welcoming you back!